Our guests can enjoy free parking in the on-site lot/garage. We are on the bus route. We have a bus stop in front of our building as well as another stop close to our location on Bobcat Ave.
We feature live music throughout the week. Our musicians play German style accordion music as well as more current American hits. Our Keg Tapping event is the 1st Tuesday of every month. The Brewmaster, with help from a select Keg Tapper, will tap our monthly seasonal bier. Live entertainment and a parade are some of the festivities during this event. We have family night the 2nd Tuesday of every month which features live entertainment, face painter, and juggling stilt walker. Kids eat free with each adult entree purchased. The 1st Tuesday of every month is our Keg Tapping. We tap the month's seasonal bier starting at 7:00 pm. Parade and festivities during the event. The 2nd Tuesday of every month is Family Night. Kids eat free with adult entree purchase. Face painting and live entertainment make this a fun night for the whole family! Our catering menu is available to any group that would like us to bring Hofbräuhaus to them. The menu features traditional Bavarian dishes as well as American favorites portioned for large groups. Must be within a 15 mile radius. $25.00 delivery fee is required, $50.00 if more than 10 miles. We offer private dining for groups of 20 - 450 guests. We have a variety of seating options and group menus available to ensure your event is a success. Your event can be customized with our additional services such as brewery tours, live entertainment, games, and presentation equipment. 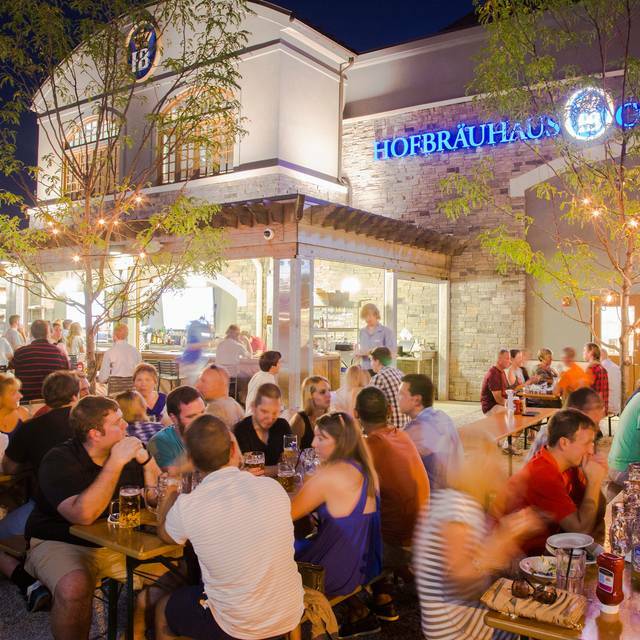 Add a Bavarian flair to your next dining adventure at Hofbräuhaus Columbus! 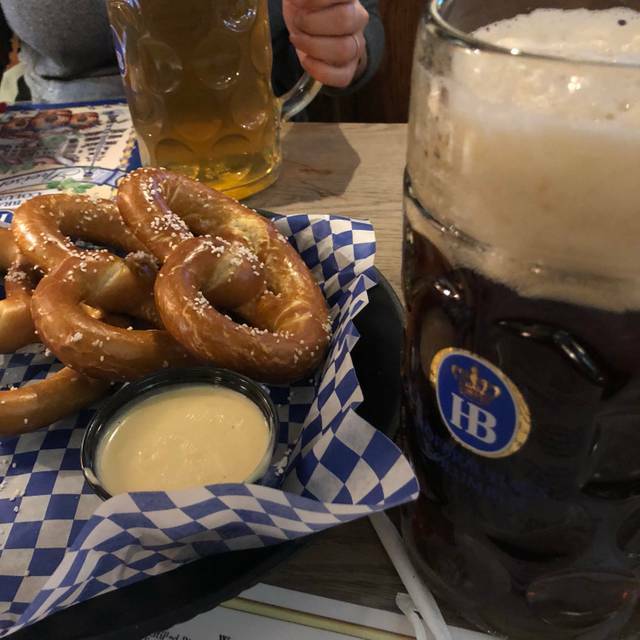 From live music and entertainment, to authentic fresh brewed Hofbräuhaus Biers, we offer a classic Bavarian atmosphere that lends itself to fun, daily. 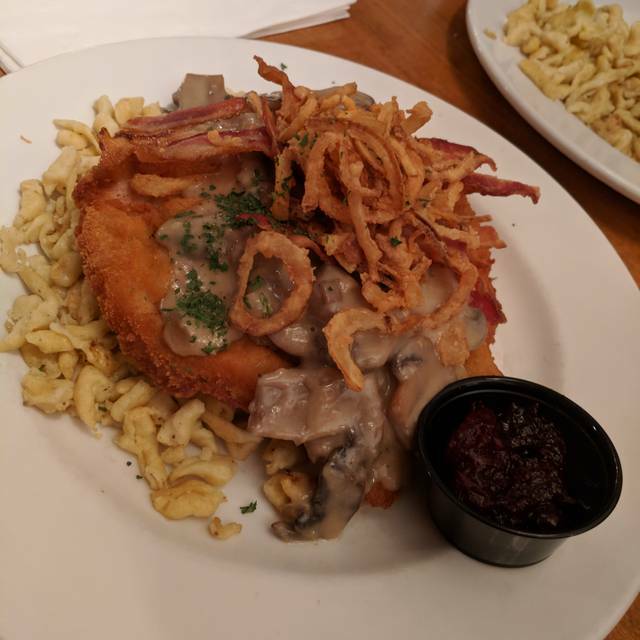 We offer authentic recipes that are made fresh daily featuring traditional Bavarian dishes, as well as American favorites, along with a variety of Soups, Salads, and Sandwiches. We are sure you will find something to please your palate! *Cooked to Order. Consuming raw or under-cooked Meats, Poultry, Seafood, Shellfish, or Eggs may increase your risk of food borne Illnesses, especially if you have certain Medical Conditions. We had never been here before and finally gave it a try on a Monday night. Food was excellent and service was great. The German potato salad was a standout, very good. We had the appetizer sampler, pretzels, sauerkraut balls, fried pickles, potato pancakes and everything was very tasty! We will definitely go again and will take family there when they are visiting Columbus. A unique atmosphere and dining experience. Wonderful service. Great food. Will definitely eat again if we are in Columbus. Waitress was great.Food was delicious.Beer was excellent.There was a good size crowd in restaurant. I was happy I used open table. This was our second visit to Hafbrauhaus. I plan to go back many more times. The service and the food was outstanding as always..
We have been to Hofbrauhaus several times for celebrations. This time, however, the noise level was far too much. Conversations at the table were impossible. The food was fine, but two of our guests didn't feel well late that evening then again in the morning. Nobody got seriously ill.
We thoroughly enjoyed our visit to the Hofbrauhaus in Columbus! It was easy making the Open Table reservation for seven, even on a Saturday afternoon. We were seated promptly and had very good service. We definitely would recommend it and hope to visit again. Exceptional customer service and delicious food. The atmosphere was great, but the food we ordered was awful. The face oainting and balloon animals were a hit for the kids. I just can mot get over the food taste, very disappointing because I loved the atmosphere of the place, it was different. Absolutely love going here. The food is great and the atmosphere festive. Really like the pretzel and beer cheese appetizer. Staff are always friendly. If you are looking for a quiet dinner out, Go somewhere else. The live music and audience involvement make for a little noise. Good food, excellent service, the only place to get really good German beir. Great place, food, service and atmosphere! I love coming here. Great atmosphere, great service and very good food. I will return and will recommend to friends. I can’t say enough amazing things about this place. Everything is always perfect for what this place is and should be. It’s a German Brewery: it’s going to be loud, beer is priced well and tastes amazing, food comes in large portions and is priced well. Perfect for all occasions with people that like a high energy atmosphere restaurant. I would say prices are a little high for what the food but portions are large and can usually share. We have eaten here quite a few times. It is consistently good. We like the food choices and the attractive atmosphere. The staff is always friendly. My husband and I met another couple here for dinner tonight. The food was delicious, three of us ordered the Bauern Schnitzel, the other person ordered the pork shank. We all enjoyed our meals. We also got the pretzels and bier cheese. No complaints at all! Have been here several times, cool German beer hall. Bar, booths, and traditional long tables. Lots of live music. Because it is a big "hall", it's kind of noisy, a little more so than a busy sports bar. Btw, does have TVs on the walls for us sports fans. Reservations recommended during peak hours (luckily, we founds seats at the bar). Everything I've ordered has been very good. The beer is great. Service has been very good (with one exception, was slow, our beers ran dry and took a while to get our check). Will totally go again, and would recommend. Excellent food and entertainment. Recommend to anyone that loves German food and drink. I loved it, will be definitely be coming back. Will tell all friends and family. Such a great time! Food was amazing! Music was great! Staff was fantastic! Did I mention that the food "es was Sehr Gut!" First time to this location. Great time and good company! Loved the German live music and dancing down front. I easily made the reservation on line. We were settled upstairs (downstairs is the party room, it can get very loud) and were able to talk and laugh. The server never interrupted, but was always there when needed. We had to fight our selves to not eat all our dinner so we could have dessert. 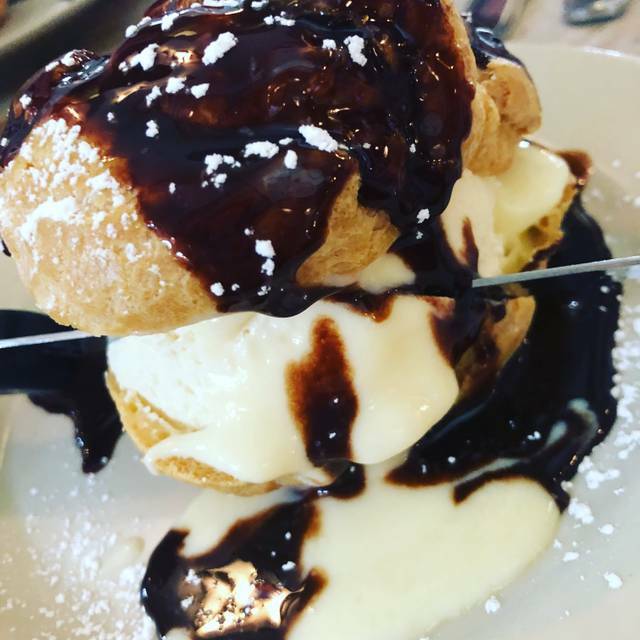 Battle won, we had Chocolate Royal Cream Puffs. After the first fork full we knew we would come back. I made a reservation which they say they did not have. The food was not very good. It is very noisy. Amazing time! Great people, environment and music!